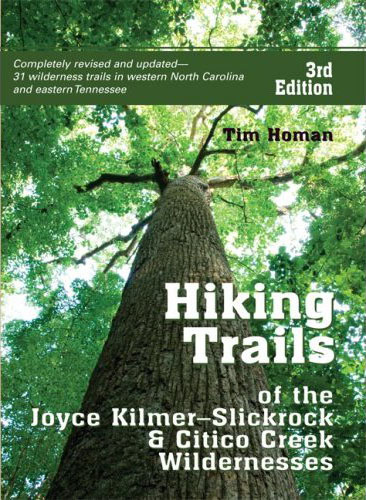 HIGHLIGHTS: Joyce Kilmer-Slickrock Creek Wilderness was designated with the passage of the 1975 Wilderness Act and expanded in size in 1984 with the North Carolina Wilderness Act. The 17,013 acres of forest shares a common boundary along the Unicoi Mountains with the Citico Creek Wilderness in the Cherokee National Forest in Tennessee, but the majority of land is in the Nantahala National Forest in North Carolina. Although the wilderness is best known for the gigantic strands of virgin timber in the Poplar Cove area, the high elevation areas including Stratton Bald (5360 feet) and Hangover offer fantastic views of the surrounding Cherokee and Nantahala National Forests. Both areas exceed 5000 feet and offer dramatic 270-360 degree views. This hike to Stratton Bald starts at Beech Gap) on the Cherohala Skyway. There is limited parking here, but the first 2.9 miles of trail is all on an old U.S. Forest Road and is a nice walk. After a brief ascent, the combined 127H and 95 mostly drop down to the junction with 54A. From here it’s a very steep 0.4 miles to Bob Stratton Bald. Most guidebooks have 0.4 miles listed – but it feels much longer than that and the trail is especially difficult in wet conditions. The open meadow on top of Stratton Bald has excellent views of North Carolina to the south and Tennessee to the west. A spring is located across the bald and on the right just down from six Balasm firs that are located on the eastern side of the bald.